Sometimes we give ourselves license to continue undisciplined behaviors and we tell ourselves, “This is the only area where I allow myself to be weak,” OR “It’s really not that bad,” OR “It’ll go away if I ignore it.” This is the beginning of self- delusion because it opens the floodgates that lead to breakdowns. We then establish a subtle tendency or a behavior pattern that, over a period of time, will seep into other self-imposed disciplines and cause them to erode. Failure is not far behind. Listen. Listen very carefully to the voices within. One is telling you to let things slide, you can get by, it’ll be different tomorrow. It’s a voice that tells you to avoid . . . resist . . . ignore . . . delay . . . deny . . . justify . . . and blame. It’s a voice that is sometimes easy to listen to because it’s the easy-way-out-for-now. But the consequences are waiting. Then there is another voice. It’s a still, small voice. See if you can hear it now. This is the voice that says, “Go for it! You can do it. You do know what to do. Do it now.” It’s the positive voice of possibility. It’s the voice that knows the inner truth. It’s the voice of action, courage and commitment. It’s the voice that tells you to take full personal responsibility and accountability for all of your results as well as the environment around you. It’s the voice that knows success/failure is completely in your hands… for you, your family, your team and your company. Be careful you don’t become part of the “mediocre drift,” a growing group of people with passive intellects. In fact, we are rapidly becoming a nation that neglects educating and disciplining ourselves. If you doubt this, just look at the number of white-collar crimes, the number of children on drugs, the resources that are wasted, the many who mistrust, fear and have lost passion. As Thoreau said, “Most (people) lead lives of quiet desperation.” The results are the by-product of poor thinking habits, a disconnection from our values and decisions that are made with no connection to what inspires us. Poor decisions follow. We cannot become stronger people, a stronger team, a stronger company, nation or planetary community until we each make a commitment to fulfill our own full potential and support others to do the same. What are the actions you need to put into place, today, to make a difference in your own life. . . to create the kind of environment you want to have . . . to make a difference? What habit do you need to break and what discipline needs to replace it? Some of you will take action today, some of you will continue to wait. And this is the curious part. Why would someone who seems to be serious about making important changes, still wander around and not take action? as Shakespeare so aptly put it. My friends . . .
What will you do today to change all of your tomorrows? Louise had a project that was due in three months. It required the gathering of a lot of data, writing a report and delivering the findings to a committee. She could have done a little bit of work on it each day, but instead she left it to the last minute. When the due date was only a few days away, she panicked, worked many hours overtime, had to take time away from her family and was totally stressed out. Being around her was not a pleasant experience. She snapped, snarled and was one to be avoided at all costs. This, of course, made things difficult for everyone else on the team as well. They walked on eggshells around her and soon they became annoyed at having to adjust to her moods. To relieve their tension, co-workers gossiped about Louise behind her back. Team morale began to erode. People started taking sides . . . It was not a happy place to work. Clearly, Louise was reacting to her circumstances and was about to go into “melt down.” One could say she was operating in desperation. This wasn’t the first time she had done this. Finally, her manager had to step in. With her manager’s help, Louise could see that she had a long pattern of procrastination. This behavior frequently led her to feeling desperate and she realized she often felt out of control. She began to realize her behavior and choices ultimately affected the whole team. She wanted to catch herself before she got in this state. She wanted to make a change. 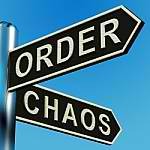 1) Desperation – when things are so completely out of control or when we are hopelessly uncomfortable or unhappy with our circumstances, we are driven to do something drastic or extreme. This is reactive behavior. 2) Inspiration – when something stirs within that encourages, moves us, awakens the spirit and reassures us of possibilities above and beyond our present situation. This is pro-active behavior. 3) Incarceration – we’ll do nothing – which leaves us in a state of helplessness, prisoners of our circumstances doomed to be locked up in a jail of our own making. Most of life’s successes and failures do not happen overnight. It is unlikely they are the result of one cataclysmic event. Rather, it is the collective weight of small daily disciplines, over a period of time, which leads to success or failure. Failure is the result of an accumulation of poor thinking, poor choices, or nothing more than a few errors in judgment repeated every day. If that’s true, then why don’t we correct the actions? Why do we do these things that undermine our success? Because we don’t think it matters. Short term, the minor oversight, the poor decision, the wasted hour, the extra dessert, the cigarette, the angry word, don’t often serve up to us immediate consequences. Yet over a long term, they accumulate until the final day of reckoning. A price will be paid. It creeps up on us quietly and soon we realize the most dangerous ingredient of failure is its subtlety. Success on the other hand, is the result of a few simple disciplines practiced every day. Change your diet or exercise and your health improves. Save a dollar a day and soon you have a few thousand. If Louise had set aside time to work on the project a few times each week, she would have been in control during the final days and been a much happier and more effective person. She would have been thinking proactively, not reactively. She would have felt powerful, not powerless. Success, happiness, peace of mind, balance, and effective work habits are all easy to achieve because all it really takes is one step at a time. We all know that we have the ability to take one step and anything we have the ability to do is easy. We may have to work hard, but it is easy. If it is easy, then why don’t more of us do it? We don’t because while it is easy to do things that bring success and happiness, it is also easy to not do them. Watch carefully for the subtle differences between success and failure. We must not delude ourselves into thinking that the small daily choices we make in order to avoid, deny, justify and blame don’t matter. They do. We must not believe that we can Be / Do / Have what we want without making changes about the way we think and operate. Louise failed to create peace of mind, balance and effective team interaction because she had ignored what was meaningful to her. She wanted a good and successful life for herself, her family, her co-workers, her company and her global community. She allowed these things to inspire her into action on a daily basis. She had become aware that her daily choices and actions made a difference to her own well being. It also made a difference to those around her. As it was for Louise, so, too, is it for you and me. Success begins with a serious commitment to changing the aspects of our current and daily beliefs and behaviors that come between us and what is truly important and inspiring to us. Desperation: Out of control. Reactive. Driven to do something extreme. Inspiration: An awakening of the spirit. Connecting with what is meaningful. Proactive. 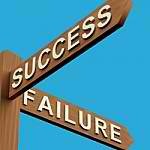 Failure: An accumulation of poor thinking and small, poor choices made on a daily basis. Success: A result of a few disciplines practiced every day. What beliefs and/or behaviors are you following that are currently limiting this from happening?